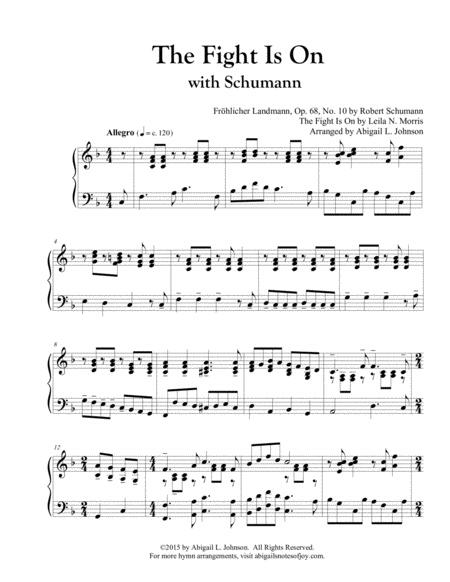 Composed by Robert Schumann and Leila N. Morris. Arranged by Abigail L. Johnson. Romantic Period, Christian, Sacred, General Worship, Repertoire. Sheet Music Single. 5 pages. Published by Abigail L. Johnson (S0.149419). 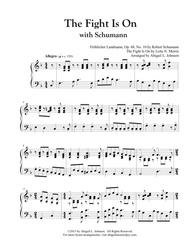 RobertSchumann's Fröhlicher Landmann (The Happy Farmer). Twice the melodyline begins in the left hand, while the right hand plays an accompaniment lineloosely based off Fröhlicher Landmann. This hymn solo is 5 pages inlength (approx. 2:25 duration), and it is perfect for church and recitalperformances year round. Abigail Johnson is a piano teacher in Pennsylvania,and she enjoys both classical music and old-fashioned hymns. Her classical hymnarrangements not only arrange the hymn in the style of the classic, but alsoarrange the classic in her own unique style. July 10, 2017 Wonderful!!!! LOVE IT!!!! will not regret purchasing this arrangement and will want to play this arrangement over and over again. HIGHLY RECOMMEND this arrangement and give it and the artist an A+++++!! !